Bucharest Early Music Festival ends on Friday, November 21, with a “Musicas Para la Camara de Isabel de Castilla” Spanish Renaissance music concert held by the Cinco Siglos Ensemble and the soloist Delia Agundez (Spain). The show will take place at the Bragadiru Palace, starting 7 pm. „Músicas para la Cámara de Isabel de Castillia” is a Renaissance music project that includes several tableaus inspired by the historical context of the early Spanish Renaissance. Apart from minstrels’ music and the stately liturgical works performed by singers and instrumentalists of the royal chapels, there was another type of music as well, played at harps, lutes, whistles and fiddles, the so-called “soft instruments” known as bajos. This ambient music dedicated to reflection or nostalgia moods were kept over time in manuscripts, chronicles or paintings. 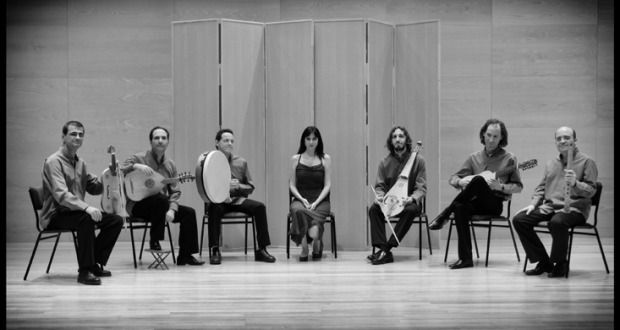 By using pieces for the vihuela and developing forms of music (known as glossas) from the famous “villancios” included in the collection “Cancionero de Palacio”, Cinco Siglos re-creates a concert that brings together works of a genre called músicas de sala (chamber music) from the times of the catholic Spanish kings. Inspired by “Cancionero de Palacio”, Cincos Siglos reenacts through concert the intimate chamber music atmosphere from the court of Queen Isabella of Castile. The ensemble has included in the concert some instruments from the medieval period – the rebec and plucked string instruments – still present during the times of Ferdinand and Isabella, and devised some complex and refined orchestrations. Cingos Siglos’ repertoire is focused on medieval music, with important pieces performed in numerous concert productions, audio registrations, and musicology articles and works. The voice of the soprano Delia Agúndez brings an expressive refinement, intuition, simplicity and a particular sensitivity all of which make it a perfect match for the style of the group of instrumentalists. Delia Agúndez sung as a soloist in many RTVE concert productions, as well as with the symphony orchestra from Cadaqués, the symphony orchestra of Región de Murcia, the Catalan Baroque Orchestra, the Santa Cecilia Orchestra and La Capilla Real de Madrid. In 2012, Delia launched the first CD titled “Voleras, entre seguidilla y bolero” with Spanish music for voice and guitar from the beginning of the 19th century. It was also in 2012 that she received the INJUVE award for the best classical music performance. The festival organized by the Antiqva Association enjoys a great audience, being rated third amongst “the most popular Bucharest festivals” as shown by the cultural consumption barometer for the year 2014, released on an annual basis by the National Institute for Cultural Research and Development.